Former prisoners of the "little camp" in Buchenwald stare out from the wooden bunks in which they slept three to a "bed." 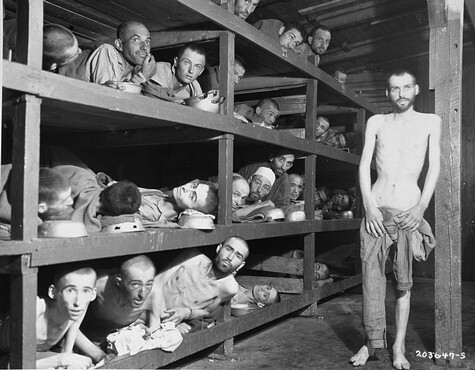 Elie Wiesel is pictured in the second row of bunks, seventh from the left, next to the vertical beam. Abraham Hipler is pictured in the second row, fourth from the left. The man on the third bunk from the bottom, third from the left, is Ignacz (Isaac) Berkovicz. [He has also been identified as Abraham Baruch.] Michael Nikolas Gruner, originally from Hungary, is pictured on the bottom left corner. Perry Shulman from Klimitov, Poland is on the top bunk, second from the left (looking up). Buchenwald, Germany, April 16, 1945. This image is also among the commonly reproduced and distributed, and often extremely graphic, images of liberation. These photographs provided powerful documentation of the crimes of the Nazi era.